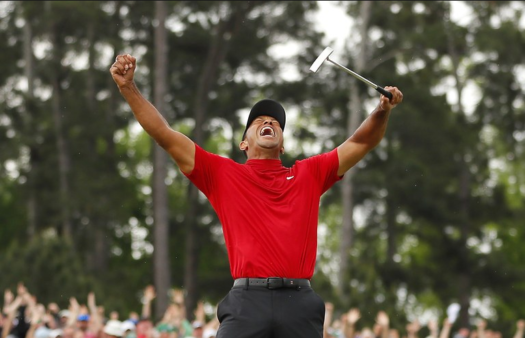 Tiger celebrating after sinking the putt to clinch the win on the 18th green at Augusta. Tiger Woods has had an injury riddled 11 year between his last major championship, and 14 years since his last Masters victory. He has had knee injuries, back surgeries, and even and Achilles injury. This did not take away from Tigers will on making a comeback this year. Being one of the most well-known golfers in the past 2 decades, Woods teed off on Sunday tied for second place at 11 under par. He was 2 strokes behind the leader, Francesco Molinari. Because he was one of the leaders, he teed off last. His tee time was 9:20. The 43 year-old was looking for one of the greatest victories in the history of the sport. He started the front 9 off with two pars on the first two holes. He then came back with a birdie and then followed that up with two bogeys. He then quickly bounced back with two birdies to close out his front 9 and put him one under par for the day. He came out on the final 9 holes and had a quick bogey. This put him two strokes back of the lead. After this, he got into a groove. He had 3 birdies between the 13th and 16th holes. This gave him a 2 stroke lead going into the 17th hole. Woods was in this same position in 2005 and bogeyed both holes. This time he made a clear effort to not do that again while still playing it smart. The 17th hole, he made par. Going into the 18th hole with a 2 stroke lead, it would have to take a miracle for anyone else to win. All he had to do was play it smart and hit it in the fairway. This is exactly what Woods did. He played it very conservative and came up with a bogey on the last hole giving him a 1 stroke win. Tiger finished at -13 and left with his 15th major championship and his 5th Masters Championship. Tiger is making a strong case to be considered the best golfer of all time. He is 3 major championships behind legend Jack Nicklaus who has 18. Tigers victory on Sunday was possible the greatest win in the history of the game of golf. This will be remembered for a very long time.